He probably thought to himself, I’m one of the luckiest guys in town. My bride is known to be one of the kindest, humblest, and most BEAUTIFUL women around. And I get to be her husband! We’ll move into our new house in a couple weeks, we’ll have a big family with LOTS of children, we’ll never have to move or deal with uncertain futures . 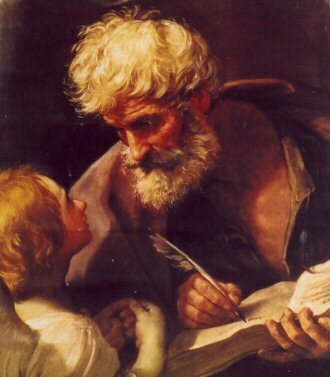 . . I’m sure St. Joseph was dreaming of these things as he prepared to start a new life with his new wife, Mary. Like his predecessor in the Old Testament, this man from Nazareth was a man of dreams. Until his dreams turned upside down. As his future wife tells him, she’s already pregnant! Joseph, your bride, she’s already expecting a child! And from what Mary has told him, this child comes from God Himself. He’s never heard anything like this before. And he certainly wasn’t expecting this. There go the dreams of a normal life, there go the dreams of a big family with, um, ordinary children, and there go the dreams of a predictable life without uncertainty . . .
By the Jewish law, he could have brought Mary up on charges, brought her before the court, openly divorced, and perhaps even worse. But Joseph, well, he’s a GOOD MAN. And, even with this fearful news, he doesn’t want to do anything so harmful to Mary. He decides to quietly divorce her. Those are his plans. Not because he doesn’t love her; but because he’s afraid. Because his greatest drams are being tested . . . so he won’t dare to move into this situation, it’s too much beyond his control, he feels too powerless . . . ‘father’ to God’s son? Yeah, right . . .
King Ahaz in the Old Testament must have felt similar – war is raging around him, alliances are being formed, and he’s encouraged to make an alliance with a foreign nation. The prophet Isaiah, on the other hand, encourages the King to trust in the God – in fact, go ahead and ask the Lord for a sign, Ahaz! Go right ahead, be bold, go ahead and dream. But he dares not. He won’t dream. He’s too afraid. Besides, could God really GET that involved in life? . . . so Isaiah says, well, fine, God is going to go ahead and GIVE you a sign . . . the Virgin shall be with child . . .
Over and over again, our God reminds these Biblical characters (and us), not to be afraid . . . and don’t stop dreaming. Getting ready for our Rectory Christmas Party. Fr. Donahue, the pastor, asked if we might have a few lights to hang, some ornaments, maybe a tree? I looked at him, as I’ve looked at all the staff members, and said, “let’s dream big, let’s think a really large family Christmas decorations, a set up that would inspire Chevy Chase.” Dare to dream! Others have reminded me of that – I recently mixed up dates and seasons, and asked a few days ago if the Redskins’ season was over . . . oops . . . . a parishioner reminded me, Father! The biggest game of the year is coming! We’re playing Dallas at 1pm – and this will be our greatest moment yet! Don’t be afraid! Don’t be afraid to dream. And don’t be afraid when the Lord sees your dream and says, wonderful, my child – you have great dreams . . . but now see MY dreams for you, which are always greater, and more amazing! And do we respond, GREAT! No . . . usually we are like Joseph – Lord, you’re expecting THAT from me? I answered, I’m sorry . . . that’s IS too much . . . He responded, “that’s why you didn’t dream this . . . I DID. And I will give you EXACTLY what you need to LIVE the dream. You’re still the luckiest guy in town. Brothers and sisters, God has dared to dream something amazing for each of us here . . . He’s about to prove it on Wednesday . . . dear Lord, give us the strength, like Joseph, to discern your dream for us, to accept it, to live it, to love it, so that YOUR DREAM for us, may become the best reality we could ever know. Amen.